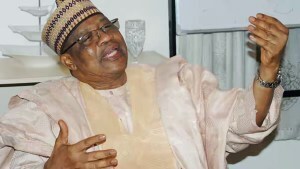 Former Military President, Ibrahim Badamasi Babangida (IBB), has stated that politics should not be played to disunite the country but should be used for the unity of the country. IBB, who received the founding fathers and members of Peoples Democratic party (PDP) at his uphill residence in Minna on Monday, advised them to be focused in their political activities and work hard for the unity of the country instead of engaging in acts that will disunite the country. He, however, reminded the delegation that “the sacrifices we made to unite the country, politicians should be able to sustain the shocks and upheavals in whatever ways to unify the country more”. Members of the delegation were Professor Jerry Gana, Former Governor of Kano State Malam Ibrahim Shekarau, Senator Ibrahim Mantu, former Minister of Women Affairs Hajiya Zainab Maina, Hajiya Inna Chiroma and Alh. Shehu Gabam. The delegation later left for the PDP state secretariat along eastern bye pass Minna where they also met with some party executives led by the chairman Barrister Tanko Beji.